Young Dental Pointed Polisher | Young Dental Laboratory, Inc.
Young Dental has recently launched the Pointed Polisher—the latest version of their Classic disposable prophy angle now equipped with a firm, latex-free cup that comes to a complete point for superior interproximal access and polishing precision. This screw-type point either comes attached to the Classic angle or it can be purchased separately for autoclavable use. The Classic Pointed Polisher has increased stability and allows for enhanced stain removal because of its ergonomically-designed tip that improves access around crowns, bridges, implants, wide embrasures, and furcations. In addition, the point is flexible enough to fit around brackets and under orthodontic wires, making it ideal for orthodontic patients. I see many patients with implants and polishing can be uncomfortable with a pointed brush. A cup polisher can be ineffective around implants as well. 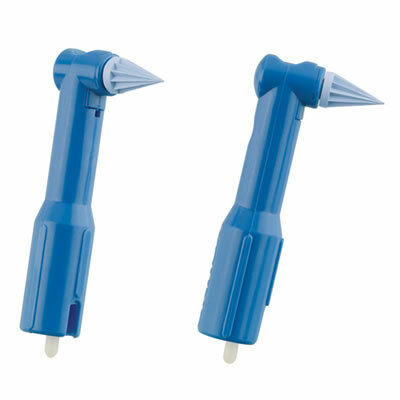 I have used this pointed polisher and it holds paste well, is comfortable for the patient and as there was no splatter! I also tried thispointed polisher under ortho wires and appliances that are difficult to clean around. I primarily use a prophy jet with ortho patients, but sometimes there is a reason you cannot use the projet so this is a great alternative and it works great!! I never thought I would find something that would make cleaning kids with braces easier than a standard toothbrush . I have always used a toothbrush with a zitcate constancy paste to clean around brackets. With this pointed polisher I smear the prophy paste around then use the prophy angle angled up, down and all around the brackets and wires. After a rinse everything shines! I love, love love it!